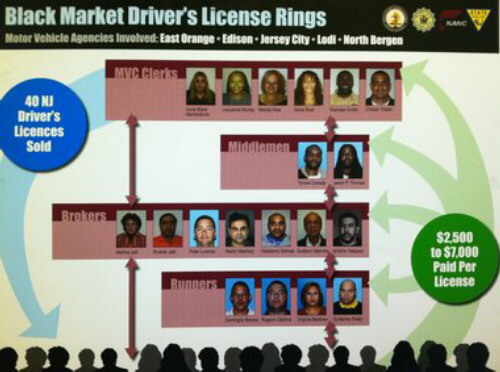 Tag Archive | "identity theft by NJ Motor Vehicle clerks"
According to a report on NJ.com, the identities of Motor Vehicle clerks and other co-conspirators (complete listing below) engaged in the sale of driver licenses to illegal immigrants has been revealed. In at least one instance, Social Security numbers to carry out this fraud were obtained illegally from a Motor Vehicle database. This news coming just weeks after two New Jersey Motor Vehicle clerks, Sherilyn Rivera, 28, of Reeves Avenue in Hamilton and Johnny Semmon, 31, of Center Street in Trenton, were charged with official misconduct, bribery, and identity theft for allegedly selling the confidential information (including Social Security numbers) of New Jersey drivers shatters any illusion that residents of the State may have had regarding the integrity of those in its employ. According to NJ.com, this most recent criminal activity was a true conspiracy, involving not only the clerks but brokers and intermediaries including runners and middle men. The brokers would identify prospective customers, help them to fill out the paperwork, and accompany them to a Motor Vehicle office where a crooked clerk would issue the license and sign off on documents indicating that they had provided adequate proof of identity according the State requirements. So much for the State’s 6-point identity verification program! Acting as collections agent, the broker would split the haul with the clerk and any runners or middle men engaged in securing the prospective customer or making contact with the unscrupulous clerk. At $2,500-7,000 per license, the participants in this latest scam on the public make the $200 charged by Rivera and Semmon appear negligible. And, with at least 40 licenses sold in this manner, had the scheme gone undetected, it would have been a Merry Christmas indeed for the rogue’s gallery listed below! While New Jersey’s Attorney General and the Chief Administrator of the State’s Motor Vehicle Commission are lauding themselves over the indictment of these individuals, one wonders what damage has been done to the residents whose sensitive information has been compromised. If the procedures in place to detect criminal activity of this nature have been effective, why did it take the sale of 40 licenses before identifications were made and action taken? And, how is it that these crooked clerks secured their jobs in the first place? What standards and criteria were employed in their hires? With unemployment levels ballooning in this State, could not employees with more honesty and integrity have been found? As citizens of New Jersey, we have a right to expect more of our government and governmental agencies at every level. The instances above beg the question of how many undetected instances of identity theft are perpetrated by state employees at every level of government. As information, particularly identity data, becomes a progressively more valuable commodity, these types of crimes by those feeding at the public trough are likely to become more prevalent. Absent the ability to protect themselves, our State’s citizens must hold our elected leaders accountable to see to it that safeguards are enacted to combat this problem.